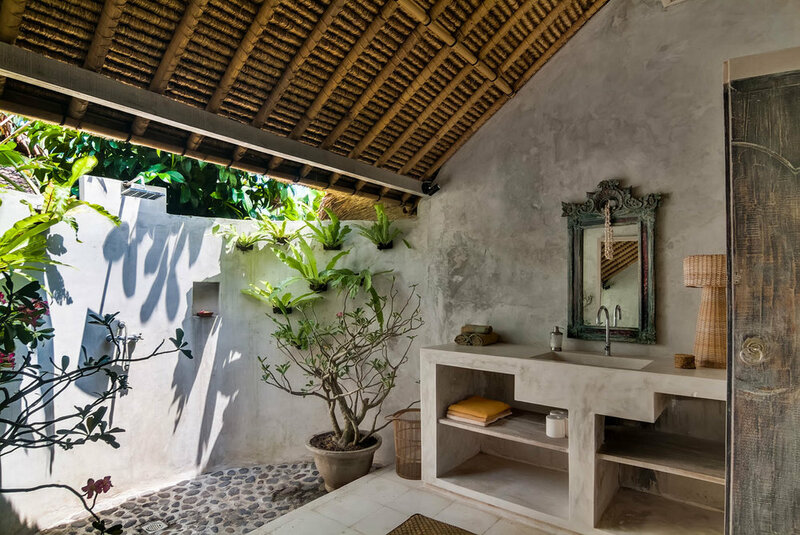 our architect designed natural villa 3, Marguerite is a remodeled Bali bungalow. Marguerite is a two story loft. Upstairs it feels like you’re in the jungle. The upstairs and the downstairs both have double beds, which makes Marguerite perfect for small families. We were featured in the New York Times: Living in Harmony in Bali and now in the new book: Seen Unseen: Embracing Natural home Design on Bali! Lounge on one of three daybeds and two balconies. Take a dip in our shared saltwater pool. We have incorporated old Javanese panels, but the spirit is modern. Enjoy sleeping under the handmade grass roof and shower in the outdoor shower. Marguerite is our newest addition to our 3 Natural Villas, Architect Natural Villa 1 and Natural Villa 2 and closest to our delightful saltwater pool that was lovingly designed with 5000 river stones on the bottom. We recommend it for families, because the downstairs has a second double bed with a mosquito net and Marguerite, unlike Jazmin and Passiflora, the living room doors can be closed at night. a carved Javanese teak panel, poured cement counters, heritage cement tiles. designed for cross ventilation. the upstairs has specially designed ventilated wood panels and ceiling fans, and standing fans. We have no AC. to minimize our footprint we have a gorgeous shared saltwater pool for the use of Passiflora, Jazmin and Marguerite. It has thousands of hand laid black river stones lining bottom and sides. we are in a hilly village, Penestanan Kaja, without cars and are hard to find. It takes approximately five minutes along a river path and then up 30 steps to walk from the car drop-off to our villas. Our recommended drivers know the way and will carry your bags. Others won't. So Different from a resort. “ Before arriving in Ubud, we had spent 5 nights at a hotel resort in Nusa Dua. It was a great introduction to Bali, but it wasn't until we spent 4 nights at Marguerite that we felt like we really experienced the unique charm of the Balinese culture. The villa itself is a secluded paradise. We felt like we were in a jungle oasis! It was so serene and relaxing, yet so close to many great shops, restaurants and spas. It feels like you're in a treehouse upstairs. We were featured in the New York Times: Building in Harmony in Bali and now our book Seen Unseen: Embracing Natural Home Design in Bali is out. Being mindful of water shortages in Bali, we have a beautiful, recently added, shared salt water pool for the use of guests in our three houses. Our neighborhood has no car access or noise, but many sounds of geckos, roosters, frogs and collared kingfisher birds, while still walking distance from Ubud (15 minutes). If you are used to a city life which is not in contact with nature, you might love our ecological joglo experience, or find it a little overwhelming. Each of our natural villas has its own personality and we carefully design every detail to make sure that staying in these transformed traditional structures is a one of a kind experience in Luxurious But Simple Ecological Living. As in all of our houses we have incorporated an antique carved panel in the bedroom upstairs. You can see the carving in this panel is traditional Javanese. The roof as in all our houses is a work of art in itself. It is made of handwoven grass known as "alang-alang". I have combined traditional elements, but the sensibility is modern with an emphasis on comfort. There are no villas in Ubud quite as uniquely in Touch With Nature as Passiflora, Jazmin and Marguerite! We have ceiling and standing fans for your comfort. WE DO NOT HAVE AC. Made and Made (pronounced Madeh) will pamper you with healthy breakfasts. Choose either a super thin mushroom or ham and cheese omelette made with the best butter and served with baby potatoes or Balinese black rice pudding or banana pancakes and Bali Buda bread, Bali Coffee and our homemade yogurt and jam. No breakfast would be complete without a plate of Balinese tropical fruit artfully cup by our angels. If you are vegan as them to make you a tofu stir fry instead. Our houses are the only ones in Penestanan to have a traditional Balinese family temple. Ask Kadek for a small tour. Jazmin is a truly unique experience for FIT folks who want to be in touch with the Bali of rice farmers in the most natural way! Enjoy! All my secret spots are password preserved for our guests after they book. This is an always-evolving list of must do and must eat and must shop from a ten year + + love affair with Bali. And my beautiful and kind and helpful staff: Made and Made, and Putu. We are doubly happy when we see the variety of different kinds of people, who are happy and make our homes their homes. That is your gift to us. I am available via email and SMS. And we have a very complete list of all things wonderful that are "must dos", our vey own little map of the neighborhood and of Ubud and a local phone for use of our guests with our numbers in them. A nice touch! Penestanan has become hip... and now has its very own yoga studio (Intuitive Flow), meditation center, approximately 10+ charming restaurants (Indonesian, Japanese, Indian, Raw/Organic, Vegetarian, Vegan) and a cafe and bakery, so you don't even have to get on your motorbike. We can organize a scooter for you for $5 per day or you can take an expensive taxi to Ubud $5 per ride.. or you can walk... 20 minutes.. to all things Ubud . You can also hire a car with a driver for about $50 US. We STRONGLY advise using our select drivers who know our location & will carry bags the 6 min. walk + 30 steps. Other drivers can't find us and won't carry bags.